Techno music just got a lot more exciting as music producer and world famous DJ Carl Cox releases a USB music album featuring highly contagious tracks from All Roads Lead to the Dance Floor. With his label, Intec Digital, Cox was looking for a completely new album experience for fans to get hooked on. “The USB will not only give you the album, but it’ll also be your key to everything I do in the next 12 months or so,” the popular British DJ says. By simply plugging in the USB, you’re automatically connected to a CMS location where you can stream and download Carl’s album and remixes and update your music flash drive. You will also have access to his global radio shows, exclusive videos, news and all other things Carl Cox. Now, you don’t have to be a clubber to appreciate club music, and that’s the beauty of this hypnotic genre — all you need is your favorite mix and a medium to play it onto, you can start grooving – anywhere, anytime. Made for the dance floor, this USB music flash drive features more than 12 tracks with various styles ranging from Vocal House, Dubstep, Drum and Bass Latin, aside from Techno. Of course, listening to it doesn’t require you to be connected to the web all the time. You can use it while on a train, in a car, in a remote area or even on a plane. The entire USB package is released in three phases so you can look forward to new, exciting features every month. The success of USB music albums has been demonstrated before. In 2007, Nine Inch Nails sold bits of their Year Zero album at their concert venues. Last year, The Fame Monster album by Lady Gaga sold out within 24 hours of its release. Music producers have done it to albums by The Beatles as well. And in January of this year, we featured Norwegian dance-punk sensation, Datarock, who released a USB music flash drive with 110 songs, 20 music videos, concert videos and 1,500 photos. With the release of Carl Cox’s new album, it confirms that the revolution of music from optical discs to USB flash drive is in full swing. As the music industry continues to struggle with low sales due to piracy, USB technology is able to provide a needed solution, combining high technology and originality not so easily copied. With USB music flash drives, artists and producers can choose to customize these devices in a way that stays true to their artistry and expands the horizons of what artists were able to with discs. They can also choose the storage capacity depending on what and how much music and multimedia they want to provide. The sleek and silver custom USB flash drive is available now. Love them or hate them—what are your thoughts on USB music albums? This entry was posted in Articles, Carl Cox, USB Albums, USB Media Player, USB Music Flash Drive, USB Stick, USB Technology and tagged All Roads Lead To The Dancefloor, All Roads Lead To The Dancefloor USB Album, Carl Cox Album Release, Carl Cox All Roads Lead To The Dancefloor Release on USB Stick, Carl Cox USB Album, Carl Cox USB Album Debut, DJ Carl Cox, USB album, USB music albums. Bookmark the permalink. 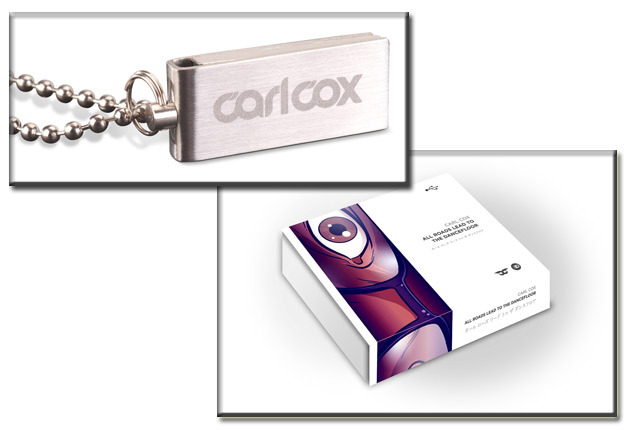 Aderra Media Technologies developed the Carl Cox USB on behalf of Intec Digital Management. All content is held within an interactive navigational dashboard designed in Flash. Multi media content can be updated and refreshed almost immediately enabling the Artist, and Label to fully engage with the fan whilst offering the client the additional benefit full analytics. This is the first of many interactive USB music projects that Aderra are working on in addition we have developed similar products for both fashion retail brands and premier league football clubs. This is a strongly written review on what could possibly be one of the greatest innovations of the music business in the 21st century. USB album just might catch on quickly, and it will possibly cause a decline in online piracy. The fact that they can be customized by artists and producers will give the technology longevity. I know that technology tends to show us a new face nearly every eighteen months, but it could be a long time before something better than this comes along to replace it. The USB album is definitely worth a look if you are seeking a new way to deliver your music to the masses.